Sandra Major of DTE Energy (center) presents a check to Susquehanna Community High School to fund Projects Chromebooks and Chromosomes for the school year. 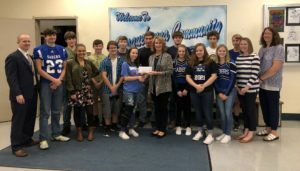 DTE Energy has stepped up to the plate to substantially contribute to the education of students at Susquehanna Community High School. DTE Energy’s $7,500 contribution has funded Project Chromebooks and Chromosomes for the 2018-2019 school year. Project Chromebooks and Chromosomes is a two-year project aimed at replacing aging laptop computers in the district’s high school science department. This financial commitment will allow students at Susquehanna to take part in virtual science labs that would otherwise be way outside of the experience that could traditionally be provided in class. Labs that deal with photons, lasers, and mass spectrometers are examples of impractical hands-on labs due to cost. However, the Chromebooks will allow students at Susquehanna Community to virtually interact with such elements of science. Project Chromebooks and Chromosomes is just the most recent example of the collaborative partnership between DTE Energy and the Susquehanna Community School District. In addition to DTE Energy’s financial contributions, the company also interacts directly with students in the school district through participation in the district’s career fair, career exploration field trips, and mock interview experiences. DTE Energy continues to play an active role in the development of students at Susquehanna Community School District. Sandra Major of DTE Energy (center) presents a check to Susquehanna Community High School to fund Projects Chromebooks and Chromosomes for the school year. Project Chromebooks and Chromosomes is a two-year project aimed at replacing aging laptop computers in the district’s high school science department. This financial commitment will allow students at Susquehanna to take part in virtual science labs that would otherwise be way outside of the experience that could traditionally be provided in class. Susquehanna Community Superintendent Bronson Stone advised the board the district’s PSSA results had been received. He noted that all testing levels, grades 3 through 8, were within two percent of the state average. The district surpassed the state average in the Keystone Exam test results, which are administered in high school subject areas (English, algebra and biology). The Keystone Exams were rolled out several years ago to be used as a statewide requirement for graduation. Exam results are also tied to teacher and district ratings. A State Senate bill (SB1095) would eliminate the Keystones as a graduation requirement for students; and five “pathways to graduation” have been outlined by lawmakers. The “pathways” approach will go into effect for current ninth grade students, Stone said. While voicing support for the “pathways” approach, Stone voiced concern over continuing to administer the Keystone exams to students who will not impacted by the results. The district was one of 70 in the state to receive a grant to bring Sandy Hook Promise programs that address bullying and suicide to the district. The Pennsylvania Department of Education has been working with Sandy Hook Promise (SHP). The funding will be used to implement SHP’s Start With Hello and Say Something, which are among SHP’s Know the Signs programs aimed at empowering students. Start With Hello encourages and guides students in creating socially inclusive school communities, while Say Something trains students to recognize the signs and appropriately intervene when they identify someone as exhibiting behaviors that they may be a threat to themselves or others. The board regretfully accepted the resignation of Region 1 representative Ashley Yoder, effective Nov. 5. Stone said Yoder was moving, and although her new residence is still in the school district, it is located in another region. The board approved about $5.5 million in fund balance designations, with $3 million committed to future employee retirement payments; $1.8 million for future medical, dental and vision benefits; and $400,000 committed to future early retirement incentives. The district earmarked $200,000 from the fund balance to be used for capital improvement projects; and $100,000 was left unassigned to be used as deemed necessary by the board. *approved the following policies: meetings; adoption of textbooks; school wellness; reduction of staff; maintenance; child abuse; food services; and public attendance at school events. In regards to the Public Attendance at School Events policy, Stone noted that policy changes address parking at the school – specifically stating that vehicles may not be left on campus without the direct permission of an administrator. He said vehicles can not be left after the campus is closed (overnight or through weekends) or they would be towed. Be the first to comment on "Susquehanna Community reviews test data"